How weird would it be to have an omelet-scented face mask? It’s almost something I’d expect to see from Too Cool for School. They’re a quirky K-beauty brand available at Sephora, and, for instance, they make this mascara I love called Dinoplatz, which is 1) amaze-balls at locking the curl from my lash curler while lifting and lengthening my lashes, and 2) it also has dinosaurs on the tube. That’s a double whammy right there! 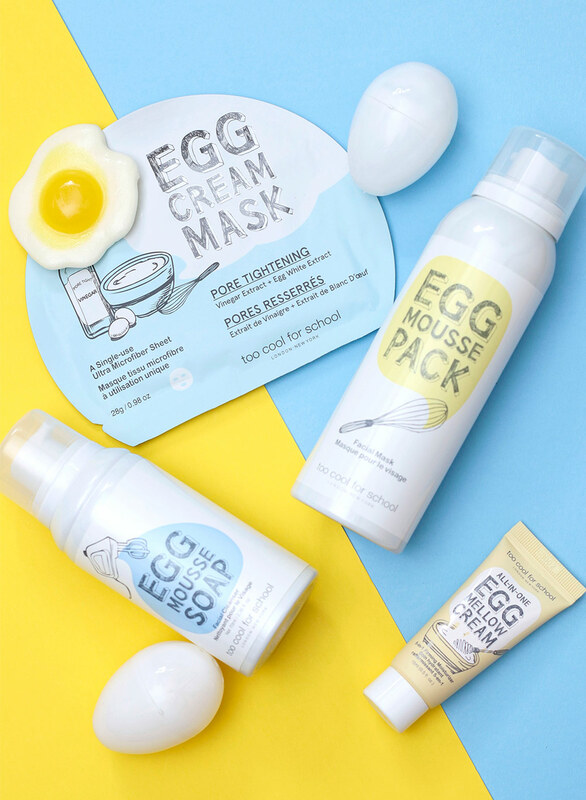 With their EGG line of skin care products, you’ll literally have egg on your face, because they all contain egg whites and yolk extracts for tightening, brightening and moisturizing. Egg Mousse Soap Facial Cleanser ($12): It contains egg white extract for dissolving dead skin cells and excess oil, but it smells nothing like a fritatta, in case you were wondering (I was). It smells like freesia to me, and I really like it. The scent is just right and not overpowering. I don’t know why, but I find it weirdly satisfying to wash my face with this thick, rich mousse. I’m definitely going to finish the bottle. My combo dry/oily skin feels clean and hydrated when I rinse it off. Water, Tea-Cocoyl Glutamate, Palmitic Acid, Glycerin, Butane, Triethanolamine, Sodium Coco Amphoace- Tate, Peg-7 Glyceryl Cocoate, Propanediol, Sodium Cocoyl Glutamate, Propane, Myristic Acid, Milk Protein Extract/Extrait Protéine Du Lait, Egg Yolk Extract /Extrait De Jaune D’oeuf, Albumen Extract, Glyceryloleate, Betaine, Coco-Glucoside, Sodium Chloride, Allantoin, Ethylhexylglycerin, Butylene Glycol, Hexylene Glycol, Disodium Edta, Phenoxyethanol, Fragrance. Egg Mousse Pack Facial Mask ($20): Again with the faint floral freesia scent. I like it! To use this mousse-y mask, you apply the mousse to your face, wait five minutes, then rinse it off. The egg yolk extract in it is supposed to be very moisturizing. All I know is that it makes my skin tingle, and after I rinsed it off, the dry, sensitive skin on my cheeks feels extra tight. I think this might be better for people with oily skin, instead of combo skin like mine. Egg Mousse Mask Pore Tightening Sheet Mask ($6): Whatever you do, refrain from eating crumbly shortbread cookies while wearing this sheet mask, because if you don’t, you’ll make a huge mess. Anywho, my pores look a little tighter after I use this freesia-scented mask… Just a little bit. 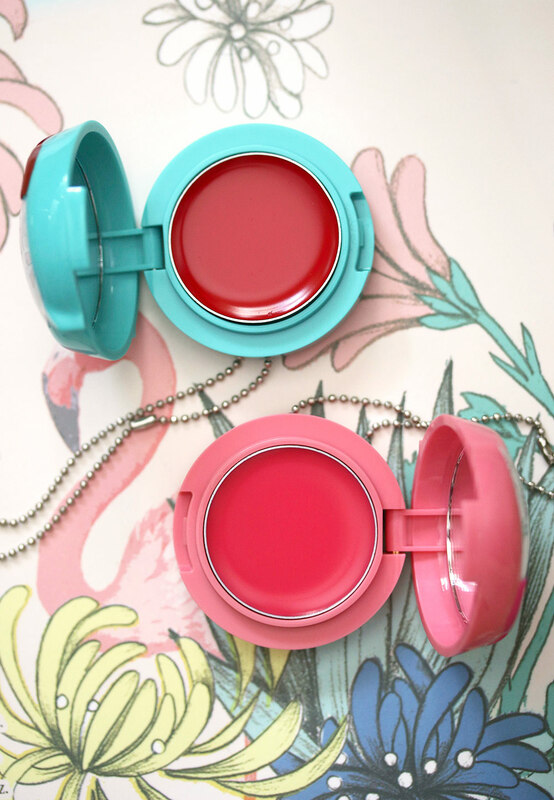 These are the new $12 Artify Max in Pocket Lip Balms from Too Cool for School. They’re available in three shades, and the one I’m wearing is #2 Pink Pink. Haha, totally kidding. 🙂 But far be it from me to deny one’s inner diva urges to over-accessorize. 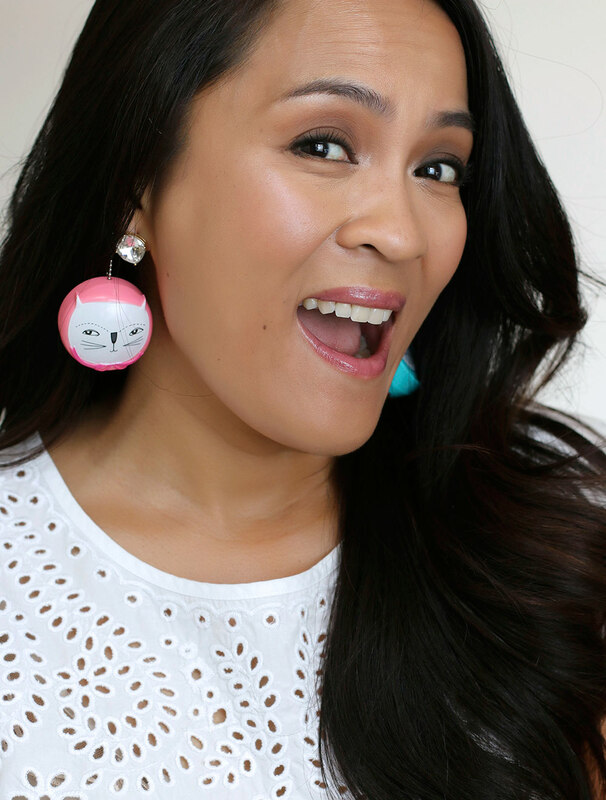 I LIVE to over-accessorize. Cute in a “DAMN, is that cat rockin’ a monobrow? 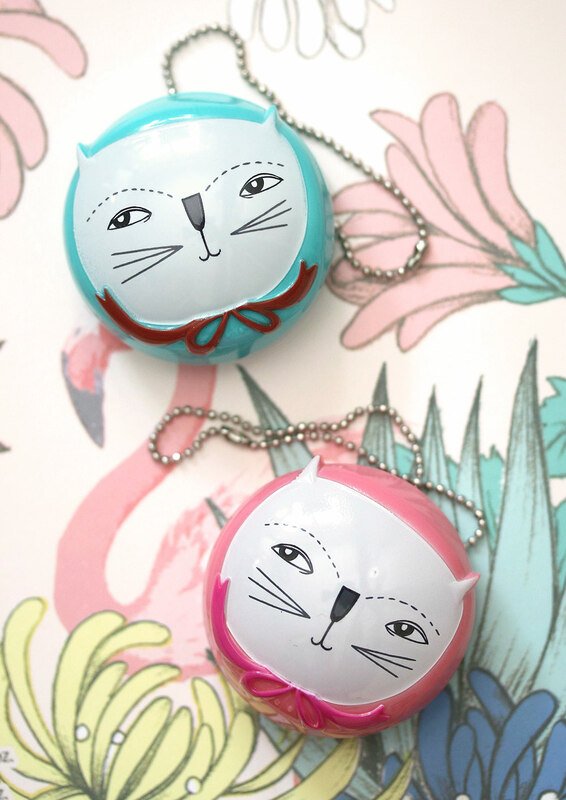 !” sort of way, the Too Cool for School Artify Max In Pocket Lip Balms are actually lip glosses.